On Christmas Eve, Ottawa finally got some snow! And then we got some more, just in time to save our New Year`s ski and snowshoe outing in Gatineau Park, which had been threatening to turn into a mountain biking or hiking affair. The plan was to pack up our backpacks and the ski pulk on Friday for an afternoon ski to Ohomisi Yurt on Taylor Lake where we intended to spend the next two days skiing, snowshoeing and welcoming the New Year. The temperature had dropped to a frosty – 18 degrees Celsius as we strapped on our packs in the parking lot. 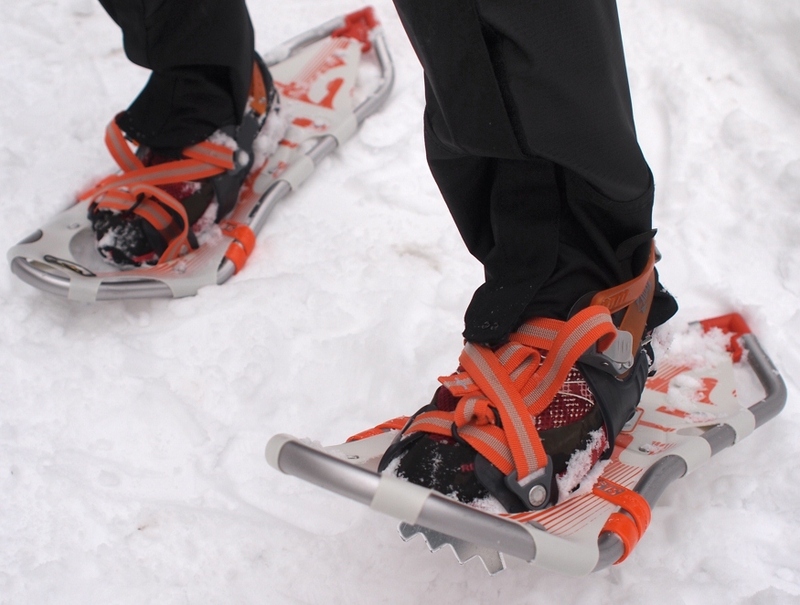 Food, water, pots and pans, dishes and cutlery, sleeping bags and other supplies weighed us down as we glided through the winter wonderland on our skis. Marc also pulled the heavy ski pulk up the hills and along the trails – after all, we weren`t going to be roughing it for New Year`s! A few bottles of wine and champagne were required for the celebration, as was the fondue set for our three course meal on Saturday night! Henri and Diane, up from balmy Southern Ontario, are not avid skiers. When we asked Henri if he needed to wax his skis, he said he had already put the tar on the wooden planks. Tar??? We didn’t inquire any further. Regardless, Henri skied along well, following Marc. Diane, in her waxless skis of an only marginally newer vintage then Henri’s wooden ones, was bringing up the rear, while I was out in front. All went well until we were a few kilometers from the yurt. As we went down a hill, our novice skiers impressed with their talents, while I hit a bump and was thrown off kilter by my heavy and poorly balanced pack. Down I went face first – the famous ostrich move – naturally in front of quite an audience of people working their way up the hill. A couple was kind enough to come to my aid, as I could neither get the pack of my back nor get up by myself. It turns out I had absorbed the fall with my left shoulder and elbow, both of which were complaining loudly about the abuse. My lips had also been transformed by the face plant into something that looked like a mix between Angelina Jolie and Daisy Duck, but the stuff dripping off my nose was just melting snow and not blood. Once I and my gear were picked up from the ground, we carried on and got to our yurt just as it got dark. A closer examination of my arm revealed that I had left pieces of my ski jacket, shirt and skin on the trail. The one item of gear that none of us had brought along was a first aid kit, so toilet paper from the outhouse had to do for dressing the gauge in my elbow. We settled in, got a bright fire going in the woodstove and then prepared a delicious pasta dinner. This was followed by lots of storytelling late into the evening. 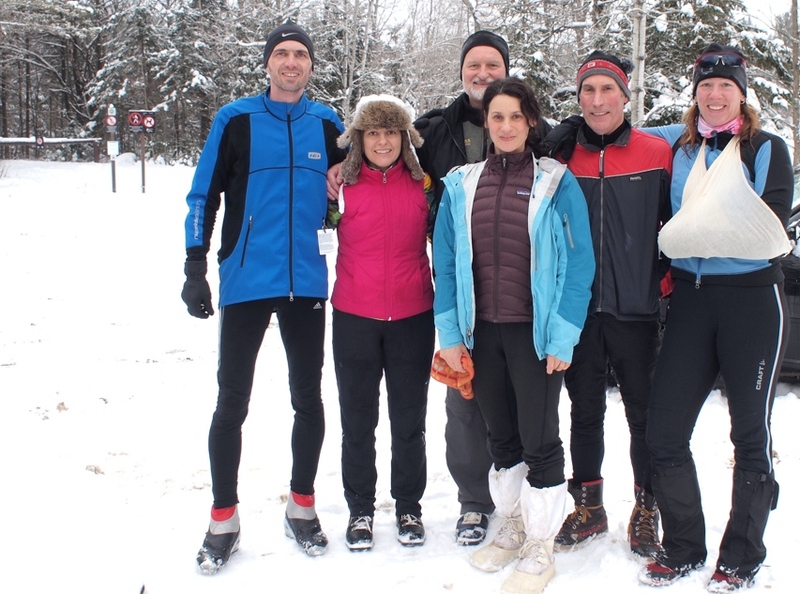 The next morning, the boys went for a ski and the girls headed out for a snowshoe. The temperature was much warmer than the previous day and it was great to be outside in the winter wonderland. 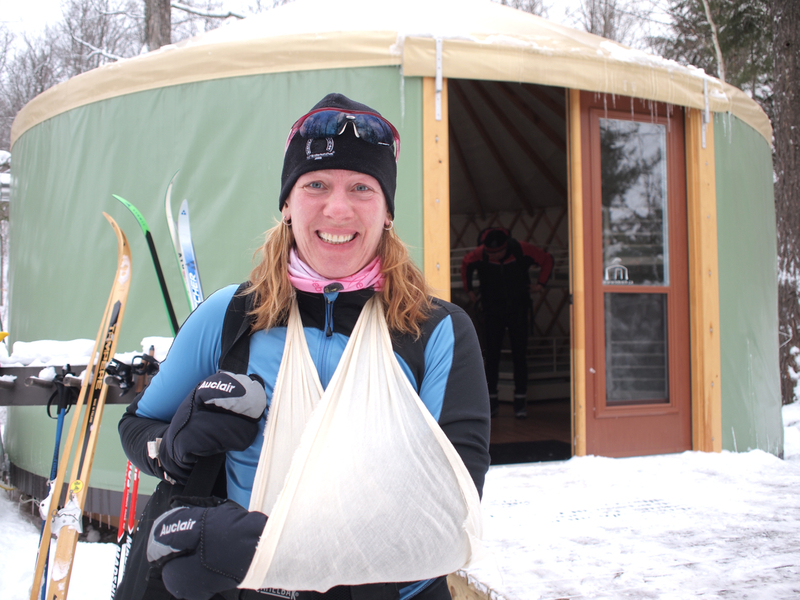 Diane and I even bumped into the ski patrol and had my arm dressed properly as well as put into a sling. A big shout out to the ski patrol guys and gals in the park who volunteer their time to help those of us who can`t stay upright on our skis! After our workout, we headed back to Ohomisi for lunch. Shortly after our meal, Gina and Gerry arrived to join us. They, too, were loaded down with supplies, including plastic champagne flutes and Christmas crackers for our dinner. We got some more exercise after lunch and then hunkered down for the feast. The first course consisted of cheese fondue – and not the packaged stuff either, but made from real Gruyère and Emmenthal. Meanwhile, the bubbly was chilling out in the snow. After a little break, we jumped into course number two – beef fondue with all sorts of delicious sauces. Then, a few games of Taboo later, we were ready for the chocolate fondue. Strawberries, apples, bananas, grapes, all dipped in melted Toblerone. We popped the Christmas crackers way before midnight and put on our silly paper hats while big flakes of snow fell outside. The battle of the boys against the girls in Taboo continued and only ended shortly before midnight in a tied game. Now it was time to bring the bubbly inside and to get the corks ready for popping! …. four, three, two, one – happy new year!!! After all the fresh air and exercise, we were ready to hit the bunk beds and curl up in our sleeping bags to get a good night`s sleep. We threw another log on the fire and each of us hoped that no trips to the far away outhouse would be required in the middle of the night. For one of our little gang of six that wish did not come true. In true gentleman fashion, to avoid waking any of us up by searching for a headlamp or shoes, he headed out barefoot into the snow. What a guy! In the morning, we had a delicious breakfast of eggs benedict and fruit salad and then it was time to pack up all our gear again to head back into town. The ski pulk and our packs were much lighter now and the trip back to the parking lot was a breeze. I can’t think of a better way to celebrate the arrival of a new year than surrounded by great friends. Wishing everyone a new year filled with friendship, health and laughter! Happy 2012 and ski safe! 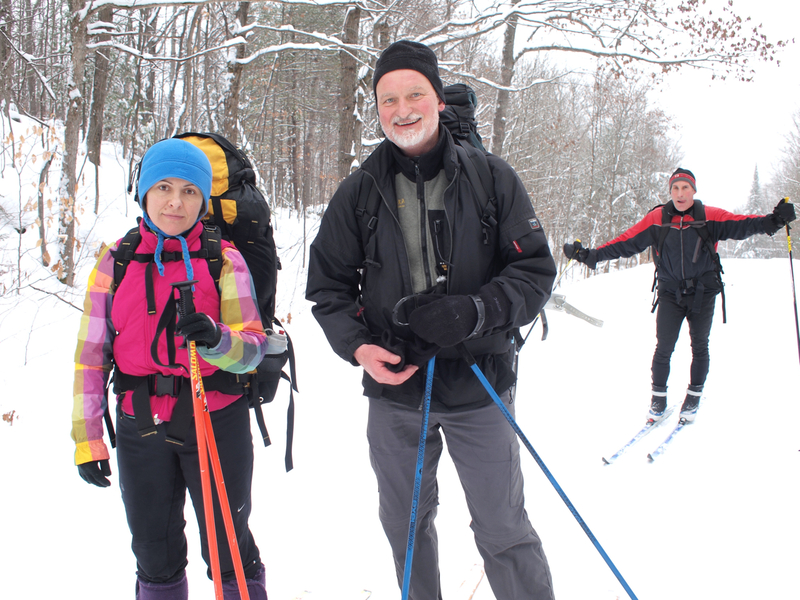 This entry was posted in Skiing and tagged cross country skiing, Gatineau Park, new year`s celebration, Skiing, snowshoeing, Taylor Lake, winter, winter camping, Yurt. Bookmark the permalink. Sounds fantastic. I’m very jealous. One day you and Marc et al will have to meet me and some east coast crew at one of the ski huts in the Chics Chocs range – about equidistant drive and ski for both regions. That would be great, Tineke! Count us in!! Yikes. Sorry about that accident (). I hope you are alright. Next mountain climb I do I am going to invite the Human Pulk Machine (Marc) to haul the beer and pretzels 🙂 What a guy! I don’t think anything is broken. I managed to run this morning – it’s just skiing that may be out for a couple of weeks. Marc was indeed amazing hauling all the stuff we absolutely “needed” to survive two days in the woods 😉 And yes, we’d love to join you on a climb one of these days. I’ll be sure to bring the first aid kit! !